Microsoft starts forced upgrades to Win10 1809. Again. This time with a next generation machine learning model. Microsoft’s starting to push the Win10 1809 upgrade on Windows 10 Home machines, and on Win10 Pro machines that haven’t been properly set to block the upgrade. I have no doubt that 1809 will be the most stable version of Win10 yet. (Damning with faint praise alert.) MS took more than three months after its release to fix the problems. But you’d be well advised to lock down and see if there are any more big surprises. Home › Forums › Microsoft starts forced upgrades to Win10 1809. Again. This time with a next generation machine learning model. This topic contains 31 replies, has 19 voices, and was last updated by anonymous 3 months ago. Heck, won’t be long they will be pushing out yet another one. So I guess Microsoft figures better push it out now. I personally dealt with many issues even after the delay, I consider it one of the worst roll outs yet. Looks like it’s time for all Windows 7 and 8.1 users to reinstall the GWX control panel, folks. I’ll install it once it gets updated to a newer version. This is Microsoft rolling 1809 out to existing Windows 10 users. It is NOT upgrading users of older operating systems. Needless to say I’ve not restarted yet. I’ve been looking for a way to roll this back without going through the install but have not had any luck. So apparently this found its way around my Windows Updates settings. Curious if other admins are seeing this. 1803 was declared approved for business 7/10/2018. Has it been more than 180 days? By my calculation it’s been 190+ days. It forced the update on my system, disallowed deletion via control panel, and disallowed rollback (that’s the part that REALLY p****d me off). So I went into Bios and deleted the HD. Then I was able to successfully restore an earlier version from a reboot usb. I can be as angry at Microsoft as anyone, but updates (a few days ago) from W10Pro-1803 to 1809 went without incident and so far, without subsequent problems. They also installed much faster than previous updates – maybe 25 mins instead of hour or hours. I thought I had updates stalled, but apparently not. I am annoyed at Microsoft being coy about what it is about to do. Thought Patch Tuesday was happening. Computers: Two-year old cheap Thinkjet, and 2-month old home made box (Asus Z370-A motherboard). Both with run-of-the-mill software: office 2016, VLC, the usual browsers, bunch of email clients, etc. So, all in all, a decent experience, with unused backups. It’ll be interesting to see what happens with “19H1″‘s release schedule. There are people at Microsoft calling it “1903”, but one would hope that cooler heads will prevail and they’ll push this release out a bit. It’s hard to see anyone getting upset if “1903” was skipped altogether and they went straight to “1908”. My thoughts exactly 19H1 doesnt seem to hold much of anything save the promise of the elusive “Stability Version” although i’ll believe it when I see it. So errr is this 1809 or 1901?? Give it another few releases the previous version’s going to meet up with the new version at this rate, either they skip one or go to a 12 Month release, but I am preaching to M$’s deaf ears and the rest of the converted alas. My networking issues have all cleared up with Dec’s Cumm. update and indeed needs no special intervention either in Services, Drivers or running via GPOL netcfg -d at shutdown. Not a word nor can I discern anything about the issue from M$. One niggle, trivial in nature I know, but late Decemeber they managed to mess up the UWP Weather App tile yet to be fixed, sporadic in nature on an 1803 Home Machine, none functioning on an 1809 Pro Machine. Wouldn’t care normally with the UWP apps but its -17C outside and Snowing so the onset of a potential major Snow Dump in the offing focuses one’s mind wonderfully. For those with similar Apps woes better to wait it out as I have tried WSRESET CMD including updating, normal uninstall and reinstall, Power shell remove and reinstall, Power Shell disable development mode oh and while I was in the I removed Xbox and the other tough to remove cruddy Apps. So its probably a waiting game to see if some one at The Store or Redmond actually figures out its broke and fix’s it. All in all not bad as the Dark Theme saves the day, but its taken a long time to get here for a version that Pre Release was vaunted as a stable Version and if I remember correctly its the basis for the LTSC/B versions. The Weather Network’s Windows 7 App still works great and also runs in Win 10 no problem. Not a bad app, but it is an ad server for Google ads, which take up 40% of its footprint. Uninstalled. I iwll just use my iPhone weather app which is add free. I used the Paint program to make some notes on gborn screenshot picture, all credit to @gborn. Back everything up, I’ve had an aborted 1809 leave a trashed OS. A few times. Older and custom built machines are vulnerable. Does a metered connection stop the upgrade? Theoretically. But when Microsoft is pushing it, I think they bypass about everything except maybe Group Policy settings. Group Policy is not available to Win10 Home edition. I would say that nobody is bypassing anything and all settings are honoured correctly, unless there is a bug. The issue is that Microsoft makes all settings (on purpose) difficult to understand correctly and as such, most people who are not well versed in all the details of the operating system believe that the settings are not respected by the manufacturer. Well that, and those bugs do exist. Like that one update that wasn’t supposed to need a reboot at all, was installed with “no reboot” too, and did still force a no-warning reboot on about 1% of systems, with Event Viewer claiming that it had been a normal patch reboot afterwards. There is rarely an update not requiring a reboot and to be on the safe side, one should still reboot. Are you in an Enterprise environment to be so concerned about a reboot? Even so, why is such an issue to reboot desktop computers? Mostly it’s just the principle of it. It is my beleif that some of the terms of the Windows License agreement are coded at kernel level, and there is simply no way of getting around them other than keeping a permanent air gap, i.e. never ever ever connect a Windows machine to the internet. Of course, that makes it fairly useless except for offline game playing or writing and printing documents. If one intends to connect to the internet, one is, like it or not, connecting to Microsoft; it’s in the license. well woody it looks like running the Win10 v1809 media creation tool recently seems to download the RE-RE-released version of 1809 with KB4480116 cumulative update integrated (build 17763.253) as I read from this MDL forum thread. Definitely still not pushing this to folks in the office but finally decided to update my home laptop running Windows 10 pro. The only way I could get it installed is by using the media creation tool. This may be because my laptop is an Alienware 17r3. Nearly all Alienware laptops were affected by all the spectre and meltdown patches with the exception of the 17r3 model. It appears Microsoft may be using some caution still depending on what your hardware is. I was running 1803, I checked for updates and it installed the 2 most recent 1803 updates. After reboot I checked again and reported my system was fully up to date. I tried a couple more times and stayed that way. A month or so ago I downloaded the media creation tool so I ran that version which was only a month or more old and it wouldn’t run. I went to the Microsoft site and noticed an updated version of media creation tool and it ran and installed with one scary moment. During one of the reboots my laptop failed to boot and the bios was beeping repeatedly. At first I thought my drives were wiped and there was no boot device. I turned off the laptop and when I turned it back on it completed the update and now at 1809. I did run the cpu and motherboard patches previously so spectre and meltdown were already patched prior to running the update. 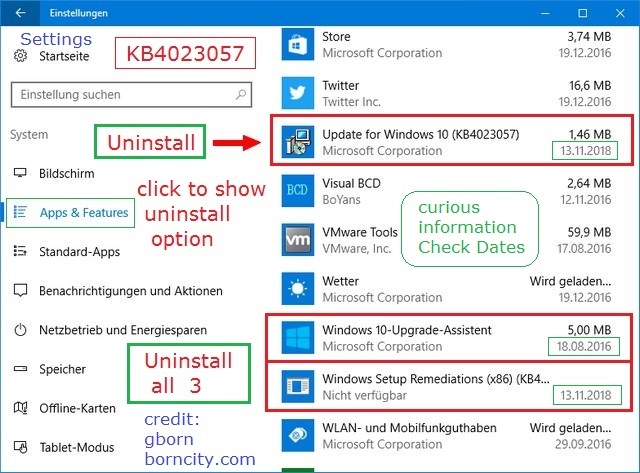 Unless I’m mistaken, KB4023057 is one of the updates you want to avoid. Has something to do with getting your PC ready for the next forced update. Please correct me if I’m wrong. So even if you disable windows update, hide every update using WUShowhide and whatnot-Microsoft/windows will bypass all of it to force the new 1809 on computers? I use WUB (Windows Update Blocker) and Group Policy Editor, and it’s never failed me even once. Been using it since Build 1511. WUB turns off Windows Update Service and makes the reg entry “read only” so MS can’t turn it back on again. Also using wushowhide with good results. Reply To: Microsoft starts forced upgrades to Win10 1809. Again. This time with a next generation machine learning model.